As recital season rolls around, I’ve been reorganizing my games and office space. This made me think about all of the games we’ve shared over the past four years – we have so many neat ones that I use all the time! So today I wanted to do a quick game round up to share with you the games I use most regularly from the blog. All too often our lives get too busy. I’m always trying to simplify my family’s schedule and my kids are not even in school yet! With my students, they seem to run from piano lessons to dance class or soccer practice or guitar lessons or church activities… Sometimes I wonder if they even have time to practice! When I can mix in a game at each lesson, I feel like they leave with a happier attitude and that they remember the concept that we reviewed in the game even better. 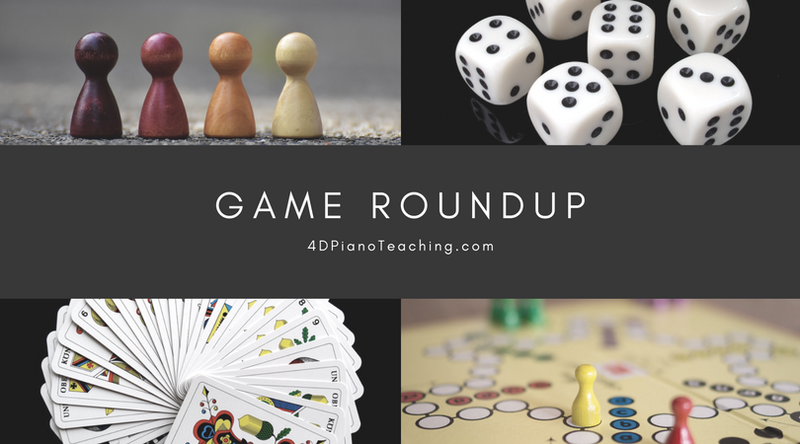 Just like with technology, I believe that games should have a purpose and when I have plenty of game options prepared I can easily choose at moment’s notice what to review – from pick up notes to solfege notation, or those pesky dotted rhythms. So on stressful days, try pulling one of these out to see your student’s grin! Recital Bingo – this is on my lesson plan for all group classes this week. Students LOVE it and their comments about each other’s performances are so much better while we use these boards! I love to use little packs of skittles for this game. 5 Finger Pattern Game – perfect to review 5 finger patterns. My students love the drawing challenge or matching them all out on the floor in a big challenge. We use this for group or private lessons. Rhythm Bingo (Level 1 & Level 2) – classics, need I say more? Students cheer when these come out! They especially love their turn to pick a card & be the “teacher” during the game. We know you love these as well since they’re the most downloaded game on our website! Musical Playing Cards – to play War, Go Fish, Spoons, and anything else you can think of. Great rhythm review and so fun for teens who think they’re too old for some other games I pull out. Rhythm Duels (Beginner & Intermediate) – another favorite for our students and highly downloaded game. We love the competition aspect that encourages our students to sight read rhythms better. Key Signature Bingo – key signatures seem to require a lot of practice for my students to conquer. And then they need to keep reviewing them in order to remember them forever. This is a quick game for my older students. It makes that review time more fun for everyone! Cute erasers & Music Alphabet Cards – two things that go together so well but don’t have to go together all the time either. We use the erasers for everything from interval reviews to scale layouts and more. These alphabet cards are so nice to pull out for young students – I have multiple laminated sets for quick games with beginners. Popular Song Mix Up – tricky rhythms become oh so fun for students to figure out. It helps them start listening and notating rhythms, something that seems so difficult when it’s their own composition notation time. Playing this game with teens leads to some improvised singing and lots of fun! Directional Bingo – Just used this this week in a sulfege listening game. Students get practice for the theory test and they don’t even realize it! They love copying my sulfege motions to help them find the answer so it accomplishes so many great points while being totally fun. Whew, that’s probably enough for now. Looking at this list, I realize our love for Bingo extends through many topics! Ha ha. I hope this helps those of you new to reading our blog to find a few new ideas. And for our long time readers, maybe this reminded you of a game you already had printed off. We hope you enjoy playing some games with your students this week! Let us know what your favorite game is in the comments below – we love discovering new games!